I woke up to the welcoming rumble of thunder this morning. Now that may not seem too interesting, but with a quick glance out the window, I saw heavy snowflakes falling everywhere and blanketing the ground. Thunder and snow– brilliant! I know I may be the last person in Minnesota (aside from my husband) who isn’t quite ready to let Winter go yet. Yes, I know it has been a long season this year, but the prospect of one last snowstorm made for a lovely start to my day. And this has to be the last one of the year right? Right? This lovely dish will keep you warm while you wait for the snow to melt. 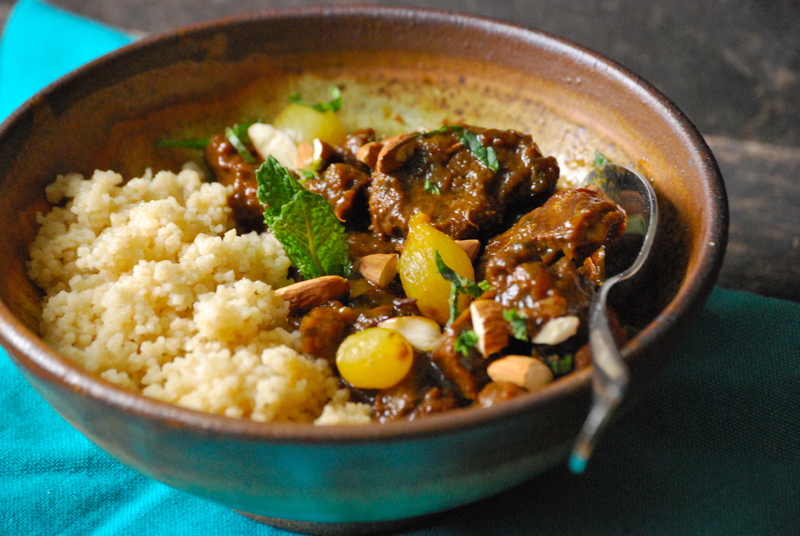 It’s a delicious Moroccan lamb tagine, which is technically a “Spring” dish. So, even if you’re not able to frolick in the fresh Minnesota snow, you can enjoy this delightful meal. What is a tagine? It’s a North African “stew” that is simmered in a special pot. The pot itself is called a tagine. It’s an interesting vessel with a conical lid which allows for less steam loss. Less steam loss means you don’t have to add as much liquid in the first place, which concentrates the flavors. The stew itself consists of a meat, paired with fruits and nuts. As it turns out, you don’t actually have to use a tagine. I don’t have one, so I turned to my trusty Dutch oven with it’s tight fitting lid. It worked wonderfully. 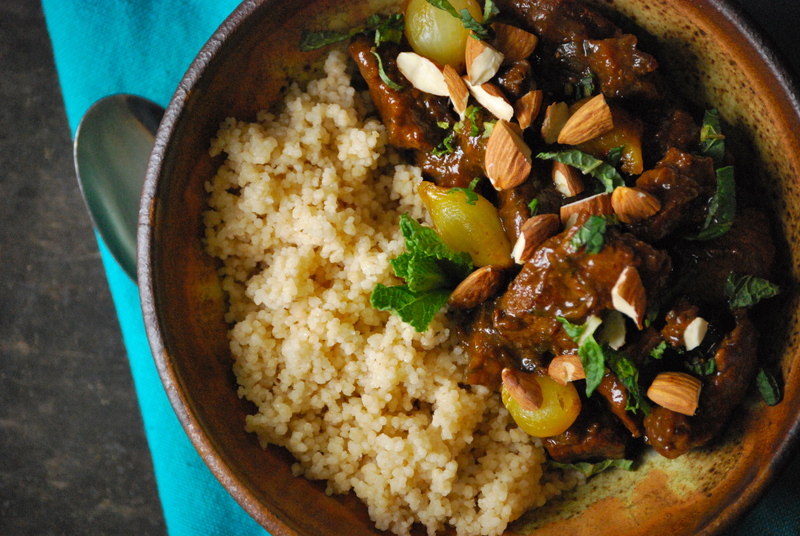 We’ve made this tagine several times, and it’s become a favorite in our house. Lamb pairs beautifully with dried fruits. It’s full of dried plums, cilantro, turmeric, and pearl onions. The dried plums disintegrate to form a splendid, slightly sweet sauce that coats the lamb perfectly. The pearl onions add a nice contrast. The dish can be served with whole wheat couscous or even quinoa and topped with chopped almonds for a bit of crunch. Add more cilantro or fresh mint for a burst of freshness. 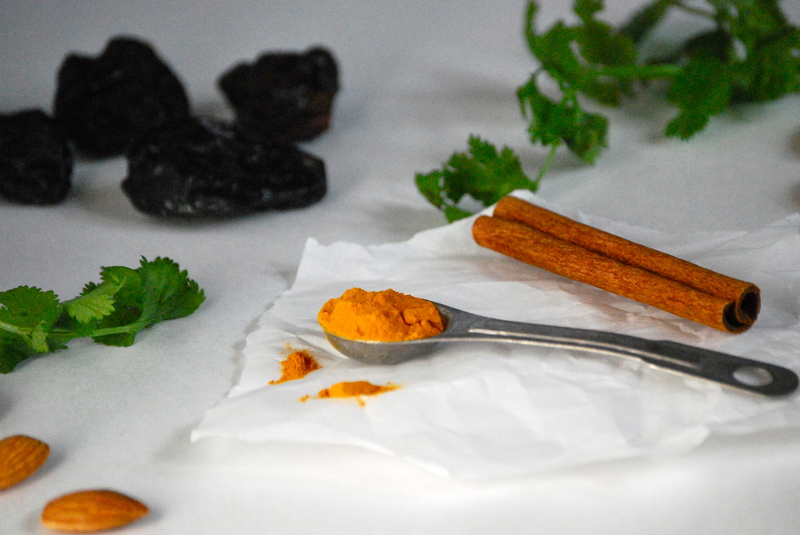 Traditionally preserved lemons or Harissa (recipe coming soon!) can be served along side, so feel free to experiment. One pound of lamb feeds our family of four perfectly, since this is a rich dish– you don’t need a pile on your plate. We serve it with a nice salad or a vegetable on the side. However, if you have more people, or are wanting leftovers (highly encouraged), feel free to double the recipe. Enjoy! Note: Saffron is a wonderful spice that is used often in Moroccan dishes. However, it is quite expensive. This tagine is delicious with or without it–so, you decide. 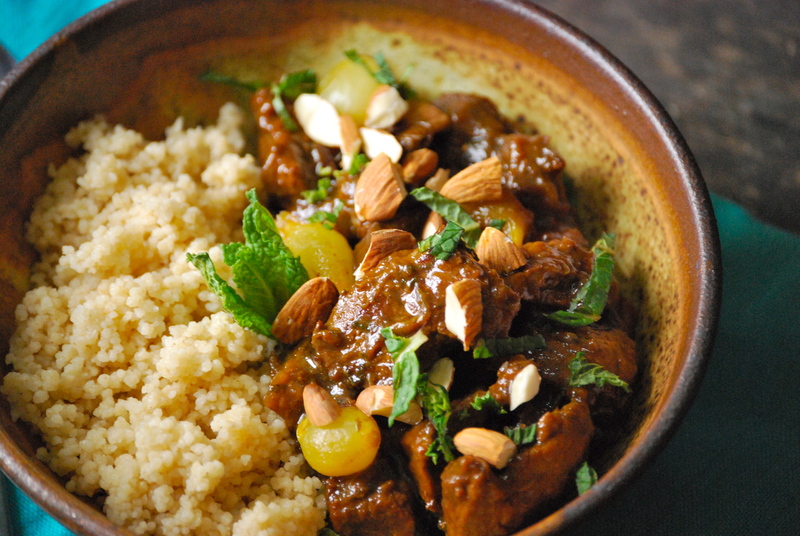 If you are fortunate enough to have a real tagine, of course use that for this dish. If you don’t have one, a Dutch oven with a tight fitting lid is a wonderful alternative. Heat a couple tablespoons of olive oil in a Dutch oven. Always use a paper towel to pat your meat dry before browning it– you will get a wonderful color this way. Season the lamb with a sprinkle of sea salt and cracked black pepper. Brown your meat in two batches, so the pan does not get overcrowded. Make sure to let the meat develop a nice dark color. Add more olive oil, as needed. Remove the meat from the pan. Add a bit more olive oil to the pan, (and even a splash of beef broth, if there is a lot of color on the bottom) and brown the chopped onion. Scrape up all of the brown bits, as they have a ton of flavor. After a few minutes, add the lamb, turmeric, cinnamon, nutmeg, saffron, cilantro, prunes, and honey. Saute for 30 seconds, then add the beef broth. Cover and bring to a boil. Remove from heat and place in the oven for about 50 minutes. Check during the baking time to see if you need to add more broth. The consistency is your choice, so add as much or as little as you want. It will thicken near the end. When it seems done, add the pearl onions and return to oven so they heat through, about 5 minutes. Garnish with chopped cilantro or mint and chopped almonds. It’s delicious served with whole wheat couscous or even quinoa. Enjoy! Thanks for stopping by Relishing It. Hope you all have a wonderful weekend! The honey is brilliant, Eileen! It works very well with the prunes. Classic Passover lamb stew served with rice or quinoa. Rice is OK now. Good to know, Stu. Thanks! I made this for dinner last night. Five out of six of us loved it and the sixth never even took a real taste. Thank you for posting it! I hope you give it a try, Rachel! It’s a pretty solid recipe– let me know what you think. Very good dish, but next time I will use less honey and dried fruits! Was a bit to sweet for my taste!